X-DinaScanner: Este E-Mail no ha sido analizado. Your Western Union account has become inactive. If you want to continue using our services, please reactivate your account. Thank you for using Western Union. Your Western Union account has become inactive. That's it, for no reason at all, it just became inactive, just like that? Yeah, as if Western Union will send an e-mail to a client, thanking him/her for using Western Union, just after deactivating that client's account. Bottom line: Western Union will NEVER send junk like this. Due to incorrect information provided during your signup process, your account has been deactivated from using our online services. Therefore, we invite you to verify your identity in order to regain full access to our services. Our enhanced security procedures will help protect your personal information. If your account information is not updated within the next 24 hours, your account will be permanently deleted and you will no longer be able to use our online services. We apologize for any inconvenience this may have caused. 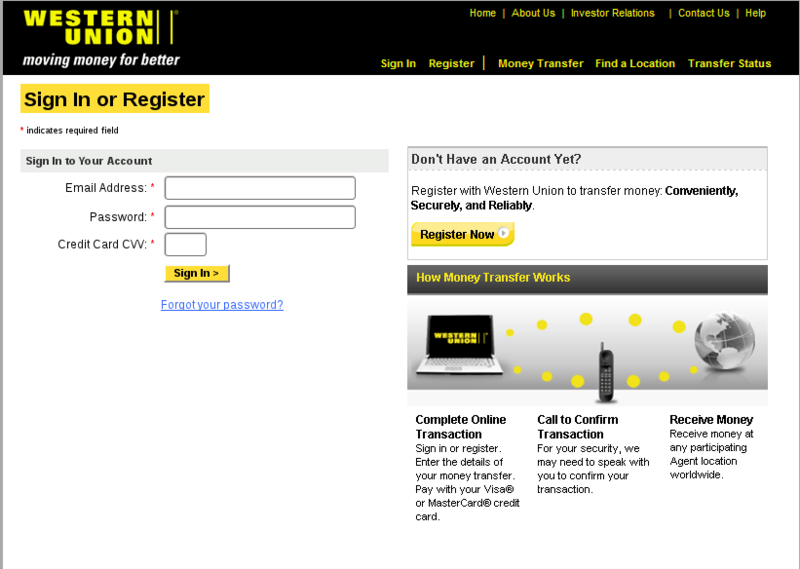 The first page is a fake login page, bearing close resemblance to the real Western Union site. Not a single link works on this page, except the "Forgot your password" and "Sign In" button. They are making 100% sure you click where they want you to click. Once you sign in, they take you to a page where you need to supply more information about your credit card, namely a 4 digit security code, the CVV2 number and the Verified by Visa / MasterCard Secure Code Password. All the links on this page are also inactive, only the Continue button works. 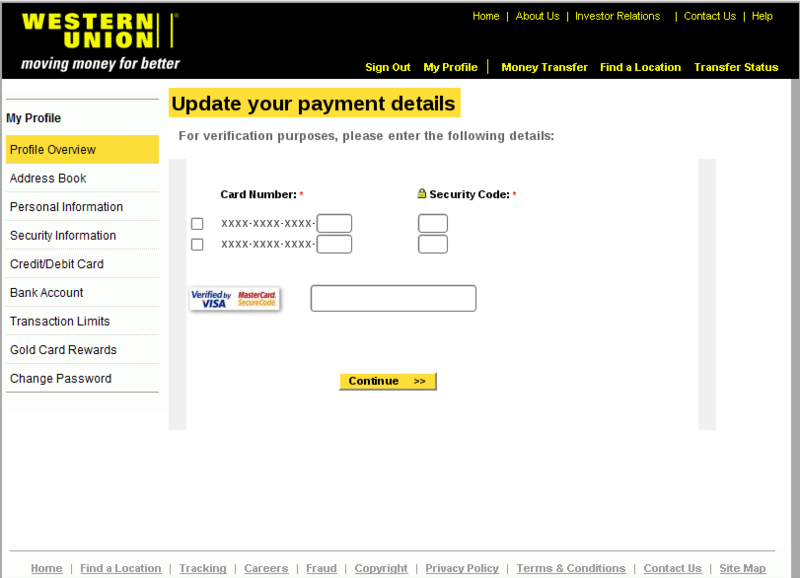 Once you click on continue, the page redirects to a page on the real Western Union website with information about SSL technology. This is to fool the victim into thinking that he/she was working on the real Western Union website all the time. Your account is activated and you need to reactivate it. The oldest excuse in the book. Western Union will never send you requests like this. The links on the website are inactive. This is highly unprofessional and should tell you that the site is not the real Western Union site. The pages are not encrypted (the address does not begin with https://). Never enter your credit card info on unencrypted pages, NEVER! They ask for your credit card info for verification purposes. That's what passwords are for and Western Union will never send you an e-mail asking for your credit card info, or an e-mail that takes you to a page that asks for your credit card info.